Natto is usually eaten for breakfast in Japan. A brief guide to all of the weird and wonderful dishes you can try during a visit to Japan. Japan is undoubtedly a country that has a plethora of delicious foods to suit any taste. Each prefecture boasts its own variety of rich local ramen and curry. Nationally, yakitori bars waft heady cedar-filled smoke down laneways and you can find the freshest sushi and sashimi everywhere, even on top of a mountain. Japan is also infamous for its unusual food options. Foods that make a lot of westerners cringe or downright feel ill at the thought of. Since variety is the spice of life, here are some of the ‘weirder’ foods you can tickle your taste buds with while travelling Japan. Disclaimer: To reduce food-related health risks we recommend seeking out trusted restaurants and establishments that are serviced by qualified professionals. Avoid eating street food that has been sitting unattended or from a vendor with little trade. Ordering raw meat from restaurants that do not specialise in the cuisine is not recommended. Have you been served raw chicken in Japan? That would be Torisashi (chicken sashimi). A dish that is guaranteed to evoke shock and horror from friends and family at home is chicken sashimi. With cries of “what about salmonella?” ringing in your ears, it can be a confronting first bite. Fresh chicken sashimi shouldn’t have an odour or strong taste about it at all. A traditional dish of the Kagoshima prefecture, torisashi can be found in almost any izakaya in the region. However, it is gaining popularity in cities such as Osaka and Tokyo and can also be easily found in the Kyushu and Okayama regions. No matter where you get it due to the preparation required in serving non-fish sashimi (i.e. getting it fresh), it’s worthwhile to track down a restaurant that specialises in it rather than leaving it to chance. It’s not just chicken breast that is available to eat raw. A restaurant with a chicken sashimi menu will also likely serve the organs as such. If you’re game. The easiest to find, and possibly the most divisive ‘unusual food’. 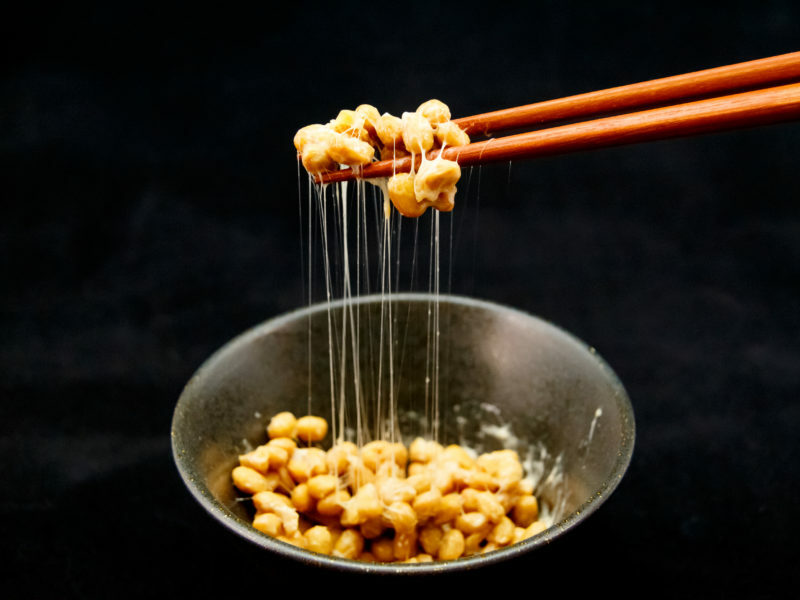 Natto is a stringy, sticky and slimy fermented soybean dish that is most commonly eaten for breakfast. The odour is pungent (think stinky socks) and the flavour lands somewhere between off cottage cheese and salty rotten beans. Natto can be found year-round in most convenience stores (often in a hand roll or tub), in buffet breakfasts and many cafes all over Japan. Natto on rice for breakfast, with a dash of soy, mustard and pickles, is a popular way to eat it. Swap your standard chicken breast skewer for a Yakitori intestine or liver. The Japanese rarely waste any part of the animal and readily consume flavourful cuts of offal over the fillets that western cultures prefer. Yakitori liver, tongue, hearts, knee joints and intestine are offered alongside belly and breast and are grilled to perfection. Yakitori bars are popular nationwide. It’s worthwhile trying them everywhere as variety and cuts differ from location and season. Horumon (horumonyaki) made exclusively from beef or pork offal is available in dedicated restaurants and is considered good for stamina and energy in the bedroom. Wink wink. Fugu is a delicacy, and only available during the winter months. It is eaten for its delightfully unusual taste, high level of collagen and is considered great for anti-ageing. So long as the poisonous parts (mainly organs) aren’t consumed as they contain the deadly toxin ‘tetrodotoxin’, to which there is no known antidote. Since 1958 chefs have been required to undergo a rigorous apprenticeship to obtain a license to prepare and sell fugu to the public. These days, cases of Fugu poisoning are rare (but not unheard of) with most occurring through amateur preparation. Winter (end of December to March). Fugu is widely available however there are many restaurants in Kyoto that specialise in the dish. There are many strange fishes available only in the winter months in Japan. Try to track down ‘Anko’ also known as Anglerfish in Tokyo and the seaside prefectures, it’s the deep sea fish with the light on its head to attract prey. The fact that grasshoppers symbolise good luck doesn’t stop them being fried and eaten. Considered pests that eat rice crops, they are a popular cooked in soy and eaten as an afternoon snack, where the crunchy texture pairs beautifully with an iced tea or beer. The Nagano prefecture is considered mecca for finding edible insects however, rice grasshoppers are available widely at bars and restaurants. Other popular insects to try are zazamushi (stonefly larvae), hachinoko (bee larvae) and inago no tsukudani (boiled locusts), mainly in Nagano. High in vitamins and low in fat content, raw horse meat is usually served cold along with soy sauce, garlic, and wasabi or nigiri sushi style. It is considered a health food and has been eaten for more than 400 years. Horsemeat is available both raw and cooked in barbecue, wagyu and sushi restaurants across the country – I stumbled across horse meat nigiri in a Tokyo sushi train. However, the regions of Nagano, Oita and Kumamoto are famed for their ‘basashi’ (raw sushi style); Kumamoto boasting a ‘cherry blossom’ basashi, named for its intense red colouring and flavour. Such lean meat requires fine preparation so as not to become tough or chewy. Paper thin slices of sashimi delicately fall apart on the tongue and are the recommended dish to order. Pick up a hot soup or coffee in the many vending machines around Japan. With a store on almost every corner, it’s worth exploring the aisles or perusing vending machines for snacks to test your bravery. Along with chips, ice-creams and soft drinks you can find dried crabs, wasabi cheese and a lucky dip of mystery meats. It’s hard to walk past the array of hot soups and energy coffees in vending machines without getting curious as to the (often surprising) taste. Vending machines and convenience stores are everywhere. Even on the ski fields. You’re never far from a snack adventure. Don’t try to translate what’s on the packet. It’s far more fun to sip it and see if you can work out what you’re eating by taste! It would be an extremely long list indeed to include all of the weird and wonderful foods available across Japan. These are a great starting point for extending your bravery and palate into the unusual. If you’re planning a trip to Japan make sure you check out our Japan travel guide, so you can read up on the very best the country has to offer!